My name is Janice Pears (now Smith) and this is St. Chad’s School photo found in my mum’s little red case when she passed away. I have many fond memories of my time at St. Chad’s. This was taken Oct 1955. I am the 5th from the left in the middle row. June Brown (Morris)is the 3rd from left on the top row. 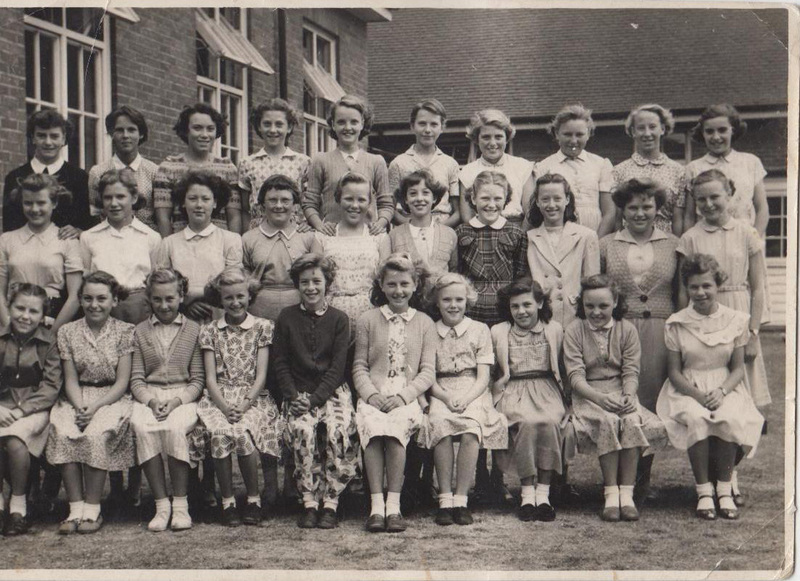 Doreen Cribb is the 2nd from left on top row, Doreen Wright is 4th top row from the left. Joan Staines is 5th from the left on top row,Pat Boyles 4th from the right on the top row. Barbara Hoskins 2nd from right on the top row.Carol Knight in 1st on the right in the middle row. Janet Ponder 2nd from right in the middle row. Tina Barley 3rd from right inn the middle row. Veronica Stanley is 4th the right in the middle row. Janet Pine is 5th from the right in the middle row. Janice Mowers 4th from the left in the middle row. Anne Gould is 3rd from left in middle row. Valarie ? 2nd from left in the middle row. Maureen Dartnell end of left middle row. Elsie Driscoll end bottom row on the left. Vivien Wright 2nd from left on the bottom row. Pauline? 3rd from left on bottom row. Iris Smith 4th from left on the bottom row. Sandra Catto 5th from the right on bottom row. Frances Carrett 3rd from right on the bottom row. Janice Moon 2nd from the right on the bottom row. Jill Briggs 1st on the right on the bottom row. I hope this is right! Please tell me if not, and sorry about the ones I couldn’t remember………..if you know please add to photo. Thanks!! Hi all, I’m Eva Penfold (as was) and I’m 5th from left on front row with Sandra Catto on my left and Iris Smith on my right. I believe that Pauline Smith is next to Iris Smith and Myra’s name was Graham. Afraid I can’t remember the names of the girls on the top row 1st left or 1st and 3rd right. What a surprise when my daughter put this on facebook. I recognise nearly all of the girls in this photo and still see some of them. Cannot believe it was that long ago. Surely we are still far too young to have been there in 1955? Lovely to see so many old school chums. I recognised those named and the girl sitting on my left is Myra ? .I am sitting bottom row fifth from right. Still see a few. Be nice to have a get together. Is the girl next to Joan Staines top row Gillian Cooper? I was Iris Smith .I went to Switzerland with Janice Pears andI think someone called felicity I think her second name was Stokes.Does any one remember me and going to Switzerland for 6 weeks with I think a religious organisation?. I then worked at the co-op in St Chads road. I recognised a few names and faces and wondered if anyone had a school photo of the upper 6 form 1956. This was my class and I have still have my school report from my time at St. Chads.